The disappearance of the 43 students from Ayotzinapa lives on in impunity. To search for truth from within the putrefaction of power is to search within the worst of this country, in the cynicism and perversion of the political class. The political class not only continues to pretend to keep up the search for the disappeared compañeros, but, in the face of growing evidence pointing to the culpability of the terrorist narco-state, it actually rewards those in charge of lying and distorting the truth. This is what they did in moving Tomás Zerón [ex-head of the Attorney General’s Criminal Investigation Agency]—the person responsible for planting false evidence to back up his historical lie about the Cocula garbage dumpi—to Technical Secretary of the National Security Council. It is one more confirmation of the criminal nature of the bad government. The south: the peoples’ struggle in defense of their territories against political bosses and large companies is dissolved by the struggle for security and justice against organized crime cartels whose intimate relationship with the entire political class is the only certainty that we as a people have about any state body. The west: the struggles for land, security, and justice occur in the midst of administrative management for the drug cartels, disguised by the state as crime-fighting initiatives or development policies. On the other hand, the peoples who have resisted and even combatted criminal activity through organization from below have to struggle against constant attempts by the bad government to reestablish territorial control by organized crime cartels—and their respective preferred political parties. 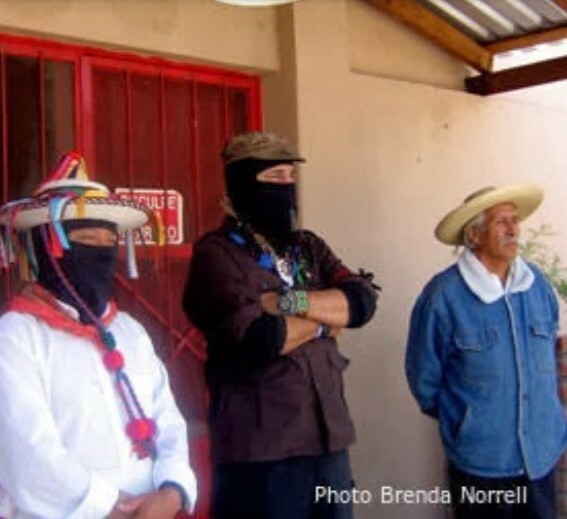 The autonomous organization of the communities and their unwavering struggles for sacred sites and ancestral lands do not cease. The defense of our Mother Earth is not negotiable. We are watching the struggle of the Wixárika community of Wauta-San Sebastián Teponahuaxtlán for the recovery of almost ten thousand hectares bordering the town of Huajimic, Nayarit. There, despite the fact that the community has established their rights in agrarian courts, the judicial authorities have been remiss. The bad governments use the false official geographies that divide the states as a pretext to incentivize the displacement of indigenous peoples. To the Wixárika people, with regard to their rebellion and autonomy, we say: we are with you. Among the originary peoples of the tribes of the north, the Sioux nation weaves its own geographies that go beyond the false official geographies that locate them in another country; for us, we are all children of the same mother. They are resisting the invasion of their sacred lands, cemeteries, and ceremonial sites by an oil pipeline under contruction by the company Energy Transfer Partners. That company intends to transport oil obtained through fracking in the Bakken region in North Dakota through their territories. This struggle has generated solidarity and unity among the originary peoples of the north. To them we say that their rage is ours, and as the National Indigenous Congress, we raise our voice with them and will continue to do so. Their dignified struggle is also ours. The peninsula: The Mayan peoples resist the attempt to disappear them by decree, defending their territories against attack by tourism and real estate interests. 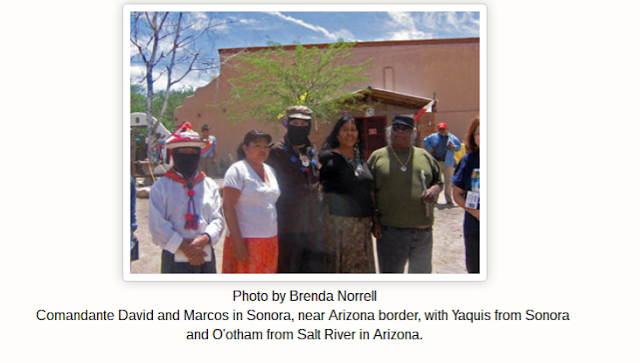 A proliferation of hired hitmen operate in impunity to displace the indigenous peoples. The agroindustry of genetically modified organisms threatens the existence of the Mayan peoples, and those magnates, with vile dishonesty, take over agrarian territories, cultural and archeological sites, and even indigenous identity itself, trying to convert a vital people into a commercial fetish. The communities who struggle against the high electricity costs are persecuted and criminalized. The center [of the country]: Infrastructure projects including highways, gas pipelines, oil pipelines, and residential developments are being imposed through violent means and human rights are increasingly vague and removed in the law applied. Powerful groups use strategies of criminalization, cooptation, and division, all of them close—in corrupt and obscene ways—to that criminal who thinks he governs this country: Enrique Peña Nieto. In various geographies across our country we are holding referendums where we say that we don’t want their mines, their oil pipelines, their GMOs, their dams, and we demand that they consult the people. But the bad government always responds by pretending “to consult as to how to consult on whether to or not to consult on the form of the consultation” (or something like that), what is really a calculated simulation, the erasure of our voice, the manipulation and cooptation of our people, as well as threats and repression. And so it goes until they say it’s done; they proclaim that we agreed to their death projects or that we were divided and they must thus attend to all points of view. We have been under siege for centuries.